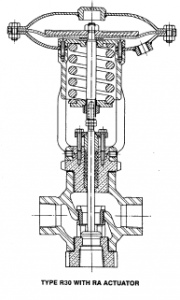 3-Way valves are designed for flow switching or diverting service and can be used with oils, gases, steam or any fluid compatible with the materials of construction. The bodies have screwed connections and are fitted with replaceable screw-in seats. Plugs can be metal seat or fitted with ‘0’-rings to give tight closure. Two actuator types each with two actions are available to allow either port to be close by the spring in the event of air failure (see specification). The R30 can be fitted with solenoid or pneumatic control valves for remote operation and limit switches to give indication of stem position. Carbon Steel. (Other materials to special order). 300ºC with metal seat, 180ºC with Viton Seat. ©Copyright 2014 Esme Valves. All rights reserved.